Do you remember the feeling? Walking down the aisle to “Pomp and Circumstance,” receiving your diploma and realizing your arduous college journey was complete. A mountaintop experience for sure. But our education doesn’t stop there. And one of the most important places we continue learning is the company where we work. That’s why learning management systems — or LMS software — exist. Businesses large and small make use of various LMS features and benefits to provide current and onboarding employees with the training they need to excel in their jobs. No two companies are the same. So even if someone received a Harvard-level education, they still need corporate training to execute their individual role. We’re going to explore some of those top learning management system features and why you should care about them. But first, let’s define what a learning management system is. We’ll wrap up by looking at some questions you should ask to make sure you pick a solution that meets your needs. What’s a Learning Management System? Simply put, a learning management system is an application that allows you to manage and deliver courses or training programs, particularly for educating your workforce. It comes with tracking, reporting and a host of other capabilities to make every aspect of your workplace education more effective. Sounds great, but even the highest-rated LMS won’t help unless it aligns with your company goals and requirements. Expert insights and user reviews are important, but ultimately, you need need to base your selection on what’s best for your company. The typical LMS has tools to aid you with managing the course. They enable you to create new material, customize content to meet your requirements and manage trainees. With the help of a content editor, you can upload materials, edit existing content and more. This gives you full flexibility over the information each module includes. One key admin feature is multimedia integration. That comes in handy if you want to upload audio and video files in addition to written content. Get support for things like PowerPoint presentations, PDFs, MP4 files and more. And it doesn’t stop there. Most systems also support external embedding, so you can insert material and assignments from web pages. Docebo, for example, lets users embed videos, images, texts and pages. The goal is to create courses that stimulate engagement and enhance the training material using third-party sources. Finally, most LMS software includes a course library. This serves as a central repository for any extra material you want to include. Having a library of pre-built courses can help get you rolling when you first implement your LMS. In some cases, you’ll get a marketplace that integrates with major content providers such as OpenSesame and Lynda that cover topics ranging from soft skills to health and safety. Your LMS system will become an integral part of your company. As such, it makes sense to customize the look and feel to match your identity and brand. Example of customization options in an LMS. A customized system creates a more unified experience. It also implies that your company is invested in giving employees the skills they need to succeed. By seeing your company’s fingerprints (metaphorical, of course) on the platform, they’ll associate their learning experience with your business. Customization gives you options so you can tailor the interface using your brand colors, logo and more. The ability to dress up the solution to align with your brand is an important feature if you want to sell your courses (more on that in the eCommerce section). Blended learning refers to education that’s a combination of virtual and classroom methods. There are a couple different ways a learning management system makes that happen. An LMS platform saves you a lot of time by automating these repetitive tasks. Additionally, it provides an online classroom setting where students can interact, ask questions and engage in conversation. Second, users have the option to pursue training at their own pace. Here, users log in and complete assignments without participating in a group. While some may flourish in a classroom setting, others prefer the flexibility and independence of self-driven learning where they can tackle modules when it’s best for them. It’s not always easy to get everyone on the same schedule. Furthermore, everyone has different learning preferences. Blended learning assures that each employee and new hire, no matter their learning style or schedule, can gain the skills they need to thrive. Virtual classrooms include features like live video and chat boxes where attendees can communicate. Let’s face it: humans are social. Sure, you have the extroverts, introverts and in-between-verts. But no matter where we fall on the spectrum, we all share a need to interact. Social learning features capitalize on this ingrained desire. Things like chat groups and forums allow course users to communicate and collaborate as they work through their modules. They can engage in peer-to-peer discussions, ask questions and get answers. Knowledge sharing also takes place via blogs, wikis and FAQ sections. You’re probably familiar with the idea that you haven’t truly mastered something until you can explain it to someone else. Social learning encourages users to absorb the content so they can do more than answer questions on a quiz. Want to ensure your employees nail their training rather than becoming robots who repeat facts? Give them the opportunity to help their peers. Once they can do that, they’ll have a deeper understanding of the material. In turn, that equips them to tackle the demands of their roles to the fullest. People love games. Even adults who are in the workforce. Why else are things like video games, fantasy football and Cards Against Humanity so popular? By their nature, games engage our attention and keep us entertained. 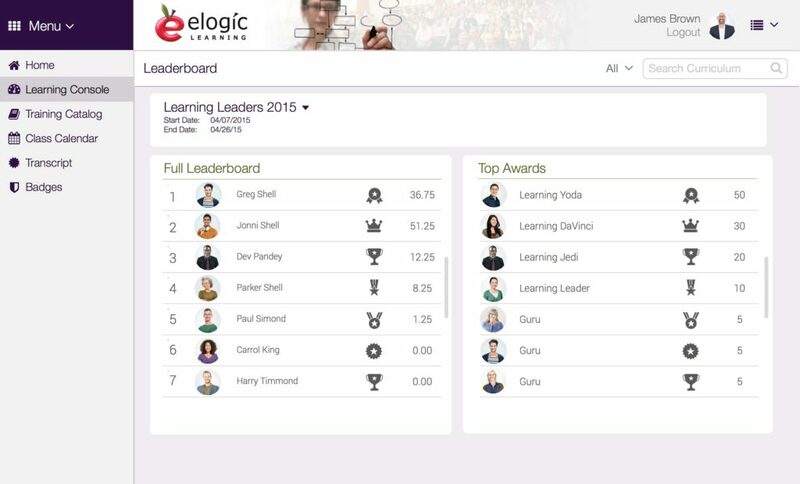 This LMS contains a leaderboard that shows employee performance. Besides keeping users engaged, gamification also encourages participation and effort. Nobody wants to see their name at the bottom of the leaderboard. Healthy competition can foster an environment where each employee puts an A effort into their learning. Did you take thermodynamics in high school? Unless you’re a genius, I’m guessing not. And even if you did, you had to cover a lot of ground before that — chemistry, math and physics. Otherwise you would have no idea what you were doing. Getting a basic understanding of a subject before moving to more advanced material is what learning paths are all about. They guide you on a path that makes sense. Having a learning path in place is critical if you want to master a subject — and not just when it comes to college courses. It wouldn’t make any sense for a new employee to jump into the middle of learning a complex process without laying a foundation. If you want to train your new social media manager how to run Facebook ads, you can’t start with setting the details for the ad to publish. They need to understand how to create a campaign first. If a new hire gets frustrated because it’s not clear what modules come in what order, that will slow down his or her progress and make the learning more complicated than it needs to be. You can also customize each user’s learning path so they get the specific info necessary to ace their roles. After all, it doesn’t make sense for your new IT guy to go through the accounting module. No matter the topic, learning paths ensure your employees receive the necessary information in the proper order so they can develop the skills they need. The last thing you need is to train employees but fail to ensure they have the necessary certification for performing their jobs. Especially when it comes time for an audit. That’s why the typical LMS has features for tracking compliance and monitoring certifications. TOPYX, for instance, has embedded e-signature capabilities to ensure learners have verified their compliance. And Atrixware’s Axis LMS uses archived reports and activity logs to ensure compliance. The system also tracks deadlines and notifies someone when their certification is about to expire. An LMS simplifies the process of staying compliant with your industry’s specific regulations. We live in a world where people want to access information on their terms. Your employees aren’t any different. That’s why most learning management tools are mobile-friendly. Greater flexibility: Your employees have the choice of where to log in to the LMS platform. One person could watch a video on his iPad while he rides the train to work, while another could take a quiz on her laptop while sitting on her couch. Increased productivity: Imagine if you were only allowed to work on your college assignments while you were in the classroom. No homework in the evenings (or on weekends if we’re being honest). That would knock your grades in the teeth. Same goes for your trainees. With mobile access, they can move through courses and take quizzes after they’ve left for the day. In turn, that frees them up to focus on other tasks while they’re at the office. On the surface, these features might seem better suited for a CRM or ERP solution. But they’re convenient for learning management, too. LMS software includes default reports, and some vendors also give you the option to create custom reports. Either way, it’s easy to analyze each employee’s progress as they work through their modules. Once someone takes an assessment, test or survey, you can view the score. This gives you a clear outlook of who’s performing well and who needs retraining. 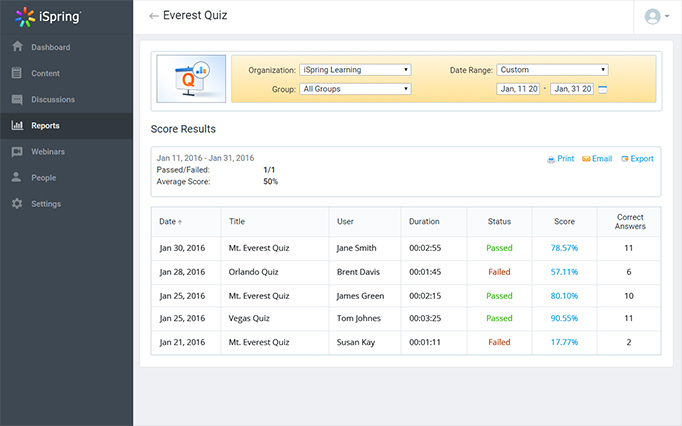 With an LMS, you can easily track results for quizzes and tests. Another common function in learning management systems in automated grading. You can use the pre-defined criteria or configure the system according to your specific needs. Certain solutions, such as TalentLMS, even let you choose the default number of grades and adjust it up or down depending on the instructor or training program. When you have dozens or hundreds of employees using the LMS, being able to track every report, quickly analyze results and automatically grade everyone’s work will save loads of time. It also ensures employees understand what they’re learning. No more guesswork on your part, wondering if the new HR assistant knows everything she should. That’ll give you confidence each employee can perform well in their day-to-day responsibilities. Recently, Salesforce began selling its training software. It may seem strange to sell your course materials to other companies, but many systems now offer integrations with eCommerce tools or built-in functions to make it possible. It takes time for companies to create training material — time they may not have. If you have some killer content, why not capitalize on that and make it available to a broader audience? That way, companies can get access to courses to improve their workplace education and you get rewarded with some extra revenue. If your company wants to follow in Salesforce’s footsteps at some point, getting an LMS system with eCommerce capabilities is non-negotiable. Want to be competitive in the modern market? Developing a strong company culture and equipping your workforce to win big are two top ways to position your organization for success. One vital part of making those goals a reality is investing in a learning management system. But where do you start? It’s a market poised on the edge of explosive growth, with forecasts predicting it to swell from its current size of $9.2 billion to $22.4 billion by 2023. Plus, over 750 vendors currently offer learning management systems. Talk about a lot of choices. As you conduct your search, use these questions to help guide you. Don’t fork over a chunk of change for a learning management system because it’s the trendy thing to do or because you woke up one day with the thought stuck in your head. You need to clearly understand what you’re trying to achieve. For example, you’ve uncovered a skills gap among your employees and need a way to improve your training process. Whatever goal (or goals) you identify should act as the compass for your decision. You may be wondering, “Does it matter?” It does. Corporate professionals and the academic industry are the two main categories LMS vendors cater to. If your organization is a university, you’ll have much different requirements for what you need in an LMS than if you’re a banking firm looking to increase the effectiveness of your onboarding process. What Are Your Must-Have LMS Features? Answering the previous question will help you here. Brainstorm a list of the features of a learning management system that you need, along with the nice-to-haves. There’s a difference, so be specific. Listing your required features will make it easier to vet vendors. It will also help as you consider advanced features. If your company has offices in North America, Europe and Asia, you may need multilingual support to deliver the content in multiple languages. What Level of Support and Training Do You Need? A new LMS won’t do anyone much good if the admins don’t know how to use it. Pay close attention to what training and support a vendor offers.  For example, Cornerstone Learning has a Client Success Center, where you can collaborate with peers and turn to experts for help with questions about the system. 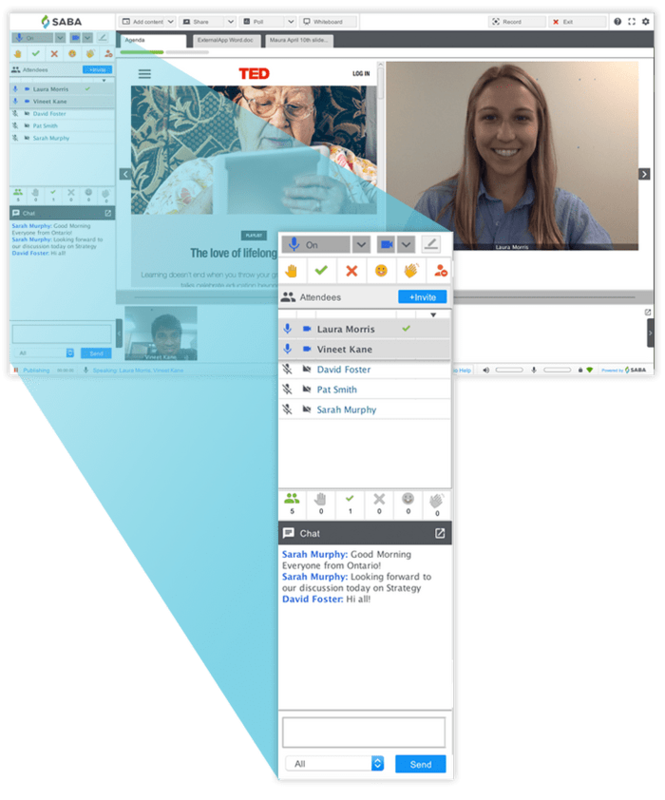 LMS solutions feature tools to educate admins, including training webinars, courses and a knowledge base library. This can create a much smoother rollout if your team isn’t familiar with managing an LMS. Also, keep your ongoing technical support needs in mind. Is there a ticketing system if you need to raise an issue? How does the vendor handle data security and backup for a cloud solution? Gain a thorough understanding of the exact ways vendors will deal with such situations. Otherwise, you might find yourself driving down a road full of potholes in the future. A skilled and engaged workforce is crucial to thriving in today’s volatile, competitive landscape. Learning management systems provide the tools your company needs to train current employees in new skills, streamline onboarding and attract top talent. Given the central role your training and employees play in your long term success, it’s imperative to find the right solution. Our goal is to make that process faster and simpler. We’ve put together a comparison report of the top LMS vendors to give you an overview of your options and inform your search process. What top LMS features do you see bringing the most positive impact for your company? Share your comments below!